What are you going to do with leftover turkey in your refrigerator this Thanksgiving? Eventually you’ll tire of eating the same turkey sandwiches, day in and day out. I don’t like to waste perfectly good food, especially when so much effort and care went into the preparation of our typical turkey dinner tradition. 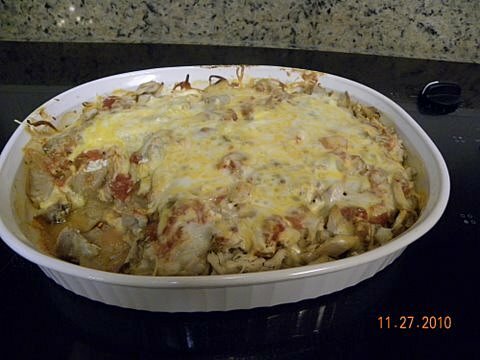 Every year, after Thanksgiving, I make a very simple casserole that gives turkey meat the Mexican twist of flavors we like so much here in Texas. The ingredients you may already have at home: Mexican tortillas (I buy the whole wheat variety), taco sauce, shredded Mexican cheese, sour cream and, of course, your leftover turkey. First, cut up the turkey into small pieces and the tortillas into medium-size squares. Spread a few tablespoons of taco sauce on the bottom of an oven-safe dish and cover it with a layer of tortilla squares. Then spread a layer of turkey, topped by more taco sauce. Add a few lumps of sour cream and sprinkle with abundant shredded cheese. Repeat the same sequence: another layer of tortillas, turkey on top, taco sauce, sour cream and shredded cheese. Cover with aluminum foil and cook in the oven at 350 degrees for about 45 minutes. If you have a very small oven pan, it may need only 30 minutes. Check it often; when you see the cheese starting to turn brown on the sides, it is done. A serving of this dish offers a well-balanced meal that is fast to prepare without the need of side dishes. It will pair well with a green salad for some extra vitamins and fiber. If you want to decrease calories, or if watching your cholesterol, you can choose the low-fat varieties of cheese and sour cream. It contains a good amount of protein from the turkey, sour cream and cheese, and a small amount of carbohydrates present in the tortillas. It also provides a good serving of calcium, needed by growing children as adults. Have a Happy after Thanksgiving!